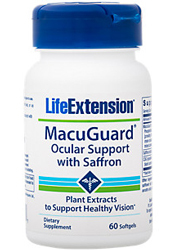 MacuGuard® Ocular Support, by Life Extension Foundation, contains phospholipids, which are an integral part of the cell membrane. In addition to mixing well with other important fat-soluble components of the eye such as lutein, phospholipids have been shown to help support efficient absorption of dietary lutein in the blood stream as well. Lutein is one of the major components of macular pigment and it is essential to proper vision. Eating large quantities of lutein and zeaxanthin-containing vegetables can help provide the nutritional building blocks necessary to maintain the structural integrity of the macula. It’s difficult, however, to increase systemic circulation of these important nutrients through food alone. Now there is an easier way to bolster your eye integrity using MacuGuard. Ingredients: (per serving) MacuGuard® Carotenoid Phospholipid Blend Phospholipids, marigold extract (flower) [providing 10 mg free lutein, 4 mg meso-zeaxanthin & trans-zeaxanthin] - 145 mg, C3G (Cyanidin-3-glucoside) [from European black currant extract (fruit)] - 2.2 mg.
Other ingredients: extra virgin olive oil, soy lecithin, gelatin, medium chain triglycerides, glycerin, safflower oil, beeswax, purified water, annatto color, potato maltodextrin. Contains soybeans. 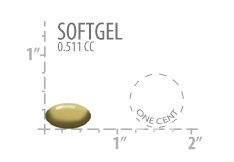 Recommended Use: Take one (1) softgel daily with or without food, or as recommended by a healthcare practitioner.